Many machinery operators, including golf courses, sports & leisure facilities, local authorities and contractors, are proactively seeking to protect the environment from pollution through a reduction in exhaust emissions from their equipment. As a result, there is a constant expectation for manufacturers to develop and apply the latest technology to deliver cleaner engine emissions while maintaining or improving machine performance. John Deere’s new 4066M and 4066R compact tractors are meeting this green challenge in several ways, thanks mainly to the use of fully integrated diesel particulate filter (DPF) technology. This innovation results in reduced engine exhaust emissions and maintains the required performance levels to meet a wide range of customer needs, says the company. 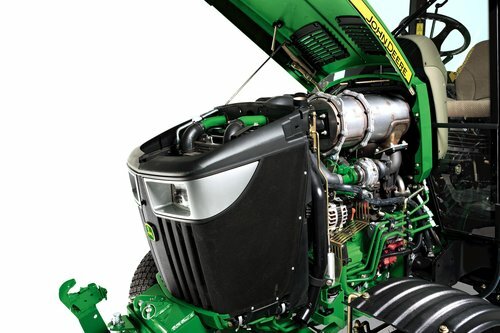 These 66hp four-cylinder compact models benefit from the same technology used in larger John Deere agricultural tractors, which helps to reduce emissions compared to standard non-DPF engines. This ex-factory solution is also designed with service requirements in mind. Except for the usual daily maintenance checks and standard servicing intervals, no additional cleaning or manual effort is required to keep the engine running efficiently, which greatly reduces labour requirements. Furthermore, easy tractor operation is provided by John Deere’s well established automatic, three-range eHydro transmission, with simple to use TwinTouch forward and reverse pedals. The top of the range 4066R model also features the award-winning Hitch Assist system. This ensures fast and safe coupling up of implements and trailers to the rear hitch or three-point linkage, meaning the operator only has to leave the tractor once. External switches mounted on the rear fender allow the operator to move the tractor backwards and forwards at a maximum speed of 12mm/second, and raise or lower the hitch as required.